Poulsbo Washington’s Marina Market is home to the Licorice Shrine. Which is pretty much exactly what it sounds like. The Shrine hovers over 500 varieties of authentic licorice from all over the world including imports from Holland, Finland, Sweden and Germany with displays that identify the country of origin by tiny country flag. There are brightly colored packages and tins of soft and hard licorices, licorices filled with blueberry, mango and pomegranate, sweet and salty licorices, super hot and gluten free licorices. For the faux licorice aficionado, the Shrine carries both Red Vines and Twizzlers, un-licorices that don’t even have licorice as an ingredient. Some licorices attempt to mimic the taste of licorice by using anise, but true aficionados know that authenticity can only be found in the ground root of the licorice plant. If drinking is your preferred way to imbibe this herb formerly used as a health tonic, among its stock of over 1000 craft beers Marina Market carries fifteen that use licorice as an ingredient. 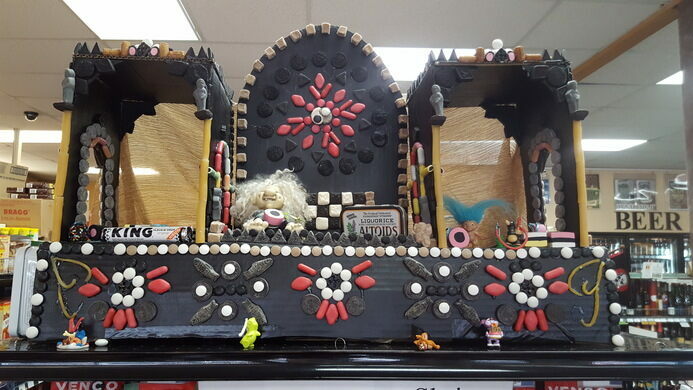 The Licorice Shrine has its own Twitter handle @LicoriceShrine that regularly tweets out updates about new varieties and shipments of stock. Marina Market is on the main downtown street of Poulsbo, Washington which can be reached by car or boat. Make a wish at what might be America's only Catholic shrine to a sinner.